A reliable source for recession forecasting is the unemployment rate, which can provide signals for the beginnings and ends of recessions. 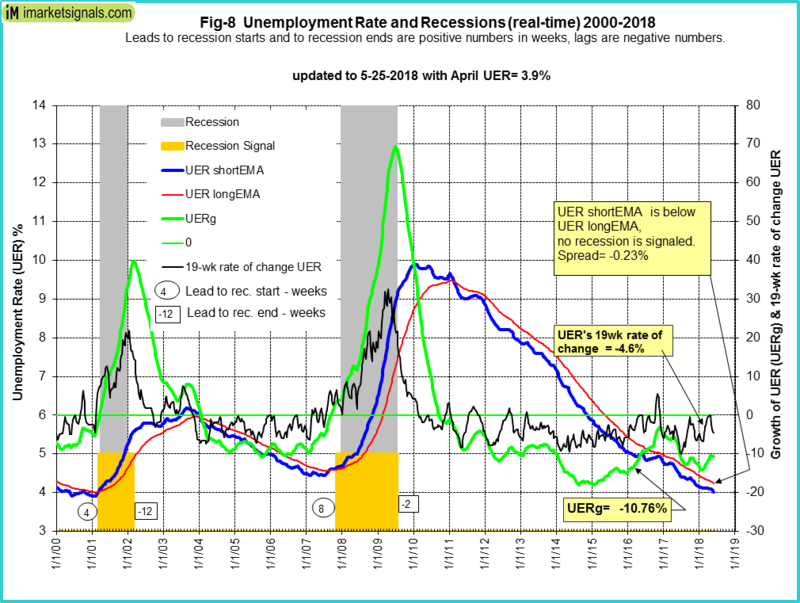 The unemployment rate model (article link), updated with the April figure of 3.9%, it does not signal a recession now. The UER declined to 3.9% after an unchanged 4.1% for the last six months. The short EMA remains below its long EMA, the blue and red graphs, respectively, and the spread is minus 0.23% and is below last month minus 0.18%. UERg had formed a trough in 2015, peaked end 2016 and declined throughout 2017, and since the beginning of 2018 is rising again. It is at a low level and at minus 10.76%, last month’s minus 11.76% – the green graph. Also, the 19-week rate of change of the UER is now at zero, last month minus 0%, well below the critical level of plus 8% – the black graph.